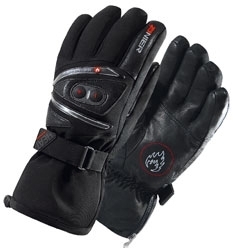 Due to its brand-new technology, the heated glove HEAT GTX warms better', longer and with less weight. and are invisible and imperceptible within the glove.
" Impulse Control" stimulates blood circulation to the fingertips. Using the function keys +/- on the upper-hand side', one of three heat settings can be selected and are shown on the leds. The lithium-ion batteries offer high performance even under extreme temperatures and are waterproof as well as shock-resistant. The supplied charger recharges the batteries over night. GORE-TEX lined 100% waterproof and breathable ensures dry hands at all times. If the weather turns warm', you can detach the power pack quickly and easily - and your Heat GTX becomes a regular top ski glove. The GORE TEX® liner ensures dry hands with or without the power pack. Please note this Zanier Heat GTX glove is designed to provide warmth to your fingers and not make them hot.